This product has been discontinued. If applicable, you can find substitution products (see "Related Products") on the detail page. Call us if you have questions. The Sentry Guardian Storage Box, GB20L comes with UL 20 minute fire protection certification and with ETL water spray resistance certification. It is a container designed for long term storage. 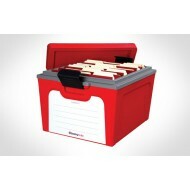 The GB20L is designed to hold both legal and letter documents/files. It has a firm latch and can be stacked one on top of the other. This is a portable security safe. 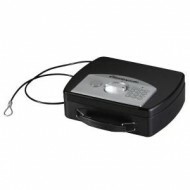 The Sentry PL048E has an advanced electronic lock, solid steel construction, and a lock down cable for longer storage. This is the perfect solution for securing items in a camper, dorm room, or hotel room. It will fit most laptops (please check the dimensions). It is easy to conceal under furniture or in the trunk of a car. The ESB-3 is a Sentry Portable Security Case. It has an easy to program and easy to use electronic lock. It comes with two override keys. EBS-3 electronic lock operates with 4AA batteries. This is an easy to carry small case. 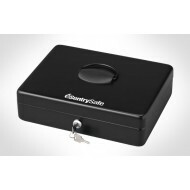 The locking key box from Sentry has the capacity for 50 keys. It comes with key tags and labels in four colors to help you keep your keys sorted. The box is ready to be bolted to the wall and hardware is included. 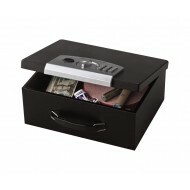 The DCB-1 is an attractive black cash box with rounded corners. It is easily portable with a fold-away handle. The interior comes with a seven slot removable tray for coins and paper money. The slots have spring loaded clips to hold down paper money. The DCB-1 has a key lock and comes with two keys. 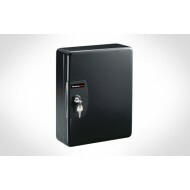 This Sentry key lock box has room to hang 25 keys. Keep them organized with the key tags and labels. This security box has a key lock and can be bolted to a wall with the included hardware. The Sentry P005K is a portable compact security case. This is a perfect case to cary with you where you want. It comes equipped with a key lock. 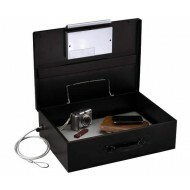 It is large enough for important small objects like keys, wallets, cell phones. It comes with a steel tethering cable for added security. 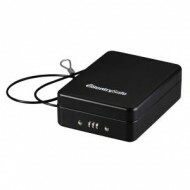 The Sentry P005C small security box is designed to be portable and fit easily in luggage or a brief case. The lock is a three wheel combination dial lock. While lightweight, is has a solid steel construction and is very durable. 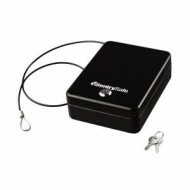 Included is a steel cable for securing the box when in a room or a car. This small cash box from Sentry has a key lock and removable tray. The tray is set up for coins while the bottom of the box is for cash, checks and other papers. The CB-12 includes a folding handle and rounded corners which make it easy to transport.